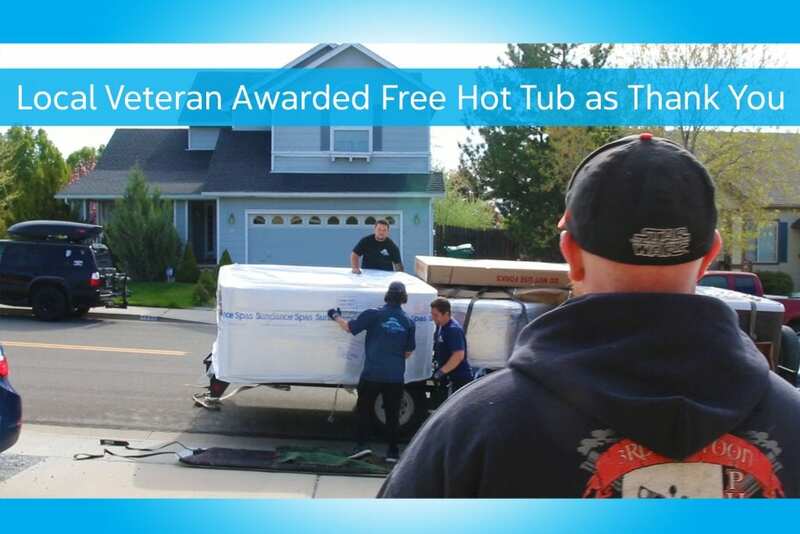 Local Veteran Awarded Free Hot Tub as a Thank You for His Service! The Spa and Sauna Co., spa manufacturer Sundance Spas, and the charity Wish for Our Heroes have teamed up to award a local veteran, Daniel Rogers, a free Sundance spa as a small thank you for his military service. Daniel, a 30-year-old husband and father of two, is a 9-year member of the Nevada Army National Guard and has been on two year-long deployments overseas and a training mission in Haiti. During his mission in Haiti, his wife, Michelle Rogers, was pregnant with their daughter. During his first deployment, to Afghanistan, Michelle was pregnant with their son, who was born 5 days before Daniel returned home. Wish for Our Heroes is “a national 501(c)(3), dedicated to providing resources to the “average” active-duty military member, in order to make their deployments a little easier, and to improve the quality of their family lives while home or during deployment,” according to their website. “Sundance Spas also chose to partner up with Wish for Our Heroes because most of the donations goes to the cause. 100% of individual donations and 95% of corporate donations go directly toward granting wishes. They’re an amazing group and we couldn’t have asked for a better partner,” said James Choi, Channel Marketing Manager for Sundance Spas. Daniel is the first veteran in Reno and Nevada to be awarded a spa through the Hot Tub for Heroes program, which is the partnership between Wish for Our Heroes and Sundance Spas. So far, together the two organizations have donated spas (or are in the middle of the donation process) with 17 veterans nationwide, according to Garrett Guinivan, Mid-Atlantic and Rocky Mountain Chapter Director for Wish for Our Heroes. On the spa delivery day, Daniel and Michelle both mentioned that they had never won any contests or something of this scale before. They are truly thrilled to have a hot tub now and have been using their Sundance Hamilton several times a day, either before work or for some family time. “It’s surreal that we have a hot tub in our backyard that we won for free,” said Michelle. Daniel, a manager at a Walmart Distribution Center, said he initially signed up for the Guard years ago because he wanted something more in life. He returned home from his most recent tour in the middle of last summer. The Spa and Sauna Co. was pleased to participate in the program. Wish for our Heroes encourages giving back to the community, something which Daniel already participates in. We wish you continued enjoyment in your new Sundance Spa, Daniel!